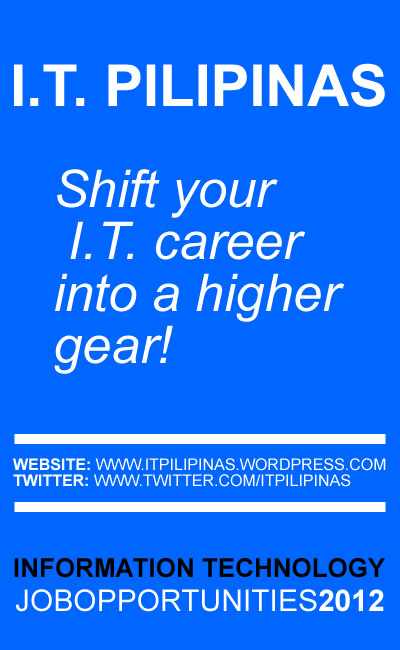 IT Pilipinas | shift your IT career into a higher gear! IT Pilipinas is an Information Technology job blogsite for those who want to pursue their career in I.T./BPO/KPO Industry. NO FEE IS BEING COLLECTED. Your resume is being pooled and stored in our database with confidentiality. If you are qualified for a position, your resume will be forwarded to our client(s). IT Pilipinas was founded in November 2011 by Madshock (www.madshock.com). It is a project initiative for the establishment of an online Job Site specifically dedicated to IT Professionals. It was directly managed and maintained by Madshock Design and Solutions.